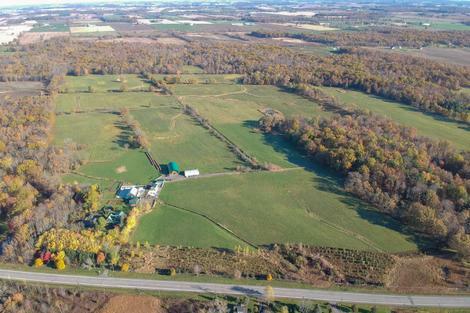 166.90 acre farm w/approx 100 acres workable & 65 acres mature forest w/trails. Two livestock barns w/horse stalls & water. 27' x 13' shed. 40' x 80' "cover all". 30' x 60' quonset. 24' x 24' wood shed. 10' x 14' garden shed. 24' x 24' heated shop. Enclosed chicken run. Drilled well services barns & buildings. 2 ponds on property. 2,129 sq ft, 5 BR home completely gutted & updated since 2005. Spacious oak eat-in kitchen. Formal living room/double French doors, wood stove, pine flooring & wainscotting. M/F master. M/F laundry. Large mudroom. Recroom features dry bar, pine ceiling & walls & in floor hot water heating. Updated vinyl windows & metal roof on house. Natural gas at Silver St.
Master Bedroom 16' x 13'3"
Laundry Room 8'3" x 5'10"
Living Room 23'5" x 15'10"
Eat In Kitchen 25'5" x 16'9"
Mud room 14'6" x 8'10"
Recreation Room 24'4" x 15'7"
Brokered and Advertised by: Re/Max Escarpment Realty Inc. Brokerage.